Egg-citing news, so we’re in cel-egg-breatory mood! 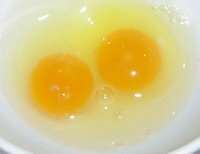 Our harem of hens have not, until Thursday, produced any eggs. As I’ve said many times before on this blog: we are absolute beginners in just about every aspect of our permaculture project here in Brittany. We’ve received loads of advice, much of it conflicting: everything from how old they are before they start laying, that they need some pretend plastic eggs placed in the henhouse to encourage them (which we bought) that they may be too fat, that they’re already laying and hiding their eggs from us while free-ranging. Reading that chickens usually lay in the morning, we’ve been keeping ours in until midday, still without success, just bemusement from chickens that normally get let out when we get up. But the waiting is over! We’ve been told that the first egg is often undersize and with the shell only partially formed so we were astonished to see that our first was huge, as you can see from the photo above, placed next to a standard egg. No surprise then that, when cracked open, it had two yolks. The hugeness of it, and it being her first an’ all, probably explains the huge amount of fuss and palaver that preceded it. The chickens had been let out at midday, Gabrielle was out and I was on the barn roof (the never-ending job) when I heard the chicken egg-laying noise, a sort of boc-boc-boc-boc-bocaaargh-boc-boc-boc-boc-bocaaargh. I came down from the roof and had a good look around for an egg, then kept a close eye on the chicken in-case it was yet to be laid. When Gabrielle came home, we went upstairs for lunch, hearing, from time-to-time, banging and clattering from below, by the front door. A brown chicken was on her own and turning and scratching around but not for food. When we went down after lunch, we discovered the egg just by the front door: doorstep delivery indeed! The following day we got a standard-sized egg but without a proper shell, like a raw egg in a plastic bag. 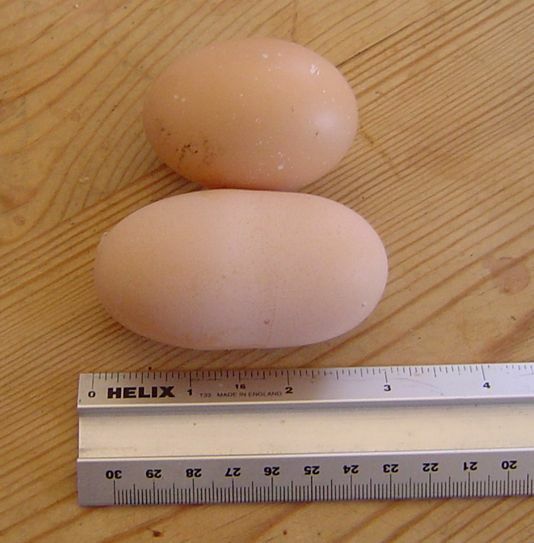 We've also been told that it is normal for chickens to lay strange eggs before they get into their new rhythm. We shall leave the chickens in all day tomorrow (Sunday) as the hunters—chasseurs—will be out and our neighbour lost two chickens to a hunter’s dog last week, so much for their help in reducing the fox population.